A combo of surgery, giant swords and dying a heck of a lot has done wonders for Atlus' balance sheet. After making an operating loss of just over $1.1 million in fiscal year 2009, Atlus USA has bouced right back in FY2010 with a profit of $5.39 million, mostly due to From Software's fiendishly tricky and unforgiving RPG, Demon's Souls. 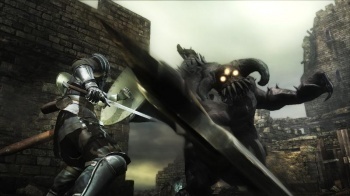 In April, Demon's Souls' US sales were said to be nearly four times higher than expectations, and then in August, Atlus reported that it had seen more interest than anticipated in the UK as well. The sales figures for the game stand at around 380,000, which is impressive for a title with such a niche audience. Other big sellers for the 2010 fiscal year were 3D Dot Game Heroes, Persona 3 Portable, and medical game Trauma Team. These numbers might seem almost trivial compared to the like of Halo: Reach, which made $200 million on its first day of release, but Atlus USA doesn't publish huge mainstream games. Instead, it publishes games with smaller audiences that might otherwise never make it out of Japan, so for it to post a $5 million profit is quite the accomplishment.